Asians and Hispanics are perceived by many restaurant servers as poor tippers. This study tests the validity of those perceptions using data from a large restaurant chain’s online customer satisfaction survey. Findings partially support servers’ perceptions – Hispanics but not Asians tipped less on average than Whites after controlling for bill size, the customer’s own ratings of service quality and other variables. Discussion centers around the differences between these findings and those of a previous study and on the practical implications of the findings for restaurant managers. © Wiley. 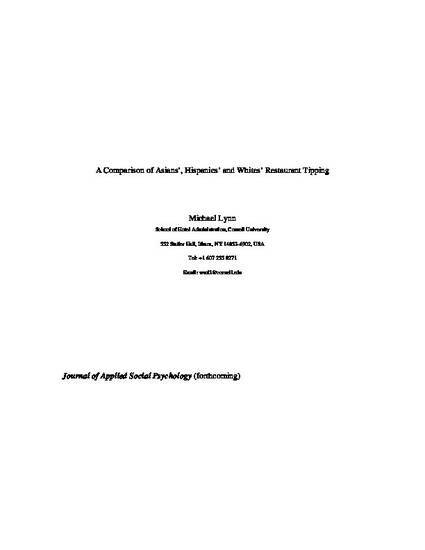 Final version published as: Lynn, M. (2013). A comparison of Asians’, Hispanics’, and Whites’ restaurant tipping. Journal of Applied Social Psychology, 43(4), 834-839. Reprinted with permission. All rights reserved.